Hi everyone, Michele here today. Continuing with our studio organization series, Pat is sharing some of her tips for dealing with books, magazines and patterns while I’ll be sharing some digital storage options that I use every single day to help keep me organized. 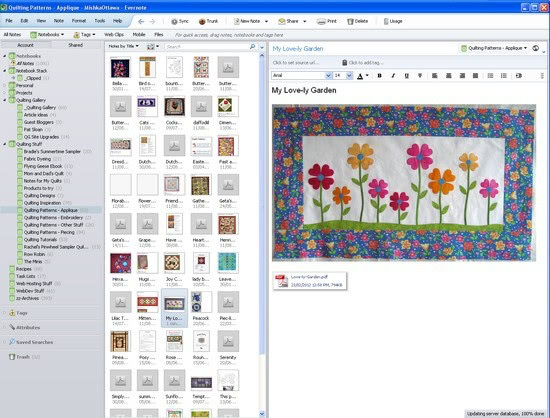 I have give-aways too, to help you get started organizing your digital quilting stuff. Reminder: We want to see your stash! Link up your blog post containing a couple photos of your gorgeous stash on this week’s earlier post: Fabric Storage Tips and Share your stash to Win!. We’re giving away two sets of “Mini Bolts” from Polar Notions. Magazines – These are the easiest for me. I tear out what I want to keep and put them in folders or binders. That is the only way I can handle it as I get so many magazines! Patterns – Here is another area to review (as we’ve said so often!). Keep what you love, move the rest out so you have space for new! Review often… or if you are really loaded down… bring one in… take one out. Books – This is the million dollar question. I can’t bring myself to rip pages out of books to save, but truth be told I’ve done it a time or two (shhhh.. our secret). Mostly I keep my favorites and move out others. As hard as that is, I have a small home and just can’t keep everything. Guilds, new quilters, selling them.. all are great options! There are two programs that I use every single day to help me keep organized and sane: Evernote and Dropbox. Both serve different purposes and are equally important to my needs and yours too. Simply put, Evernote allows me to keep track of everything and anything in one safe place. One of the main principles of productivity guru David Allen’s Getting Things Done, is that our minds are so full of all the things we need to remember, there’s little room for anything else. This stifles our creativity and makes us far less productive. We need a safe, reliable, easy-to-use system to record information, get it out of our heads, and retrieve it quickly when needed. Evernote is that place for me. Evernote allows you to capture and save anything from anywhere. This could be personal notes you type, or web pages that you’ve copied and clipped, photos that you’ve taken or emails that you’ve sent to Evernote. It’s really very simple. You can access the information in your Evernote account using your desktop computer, your smart phone or from the Evernote web site. There’s a library of useful videos, tips and ideas on using Evernote. So, how do I use it? Well, it’s a huge part of what helps me keep the Quilting Gallery running smoothly. I have folders for guest bloggers, weekly features, reminders for advertisers, requests for information, contract information, and the never-ending list of updates and tasks to be completed. I also use it for more personal stuff like my fabric dyeing experiments, saving quilt-along blog posts, research for a book I want to write and quilts I want to make. I even have a folders for inspiration that I look through when I need a motivational boost. I tried other systems, and even developed a database of my own, but for some reason, nothing else ever worked for me as well as Evernote has. It’s such an important part of my workflow that I even wrote an article about it in 2010 for The Quilt Life magazine. 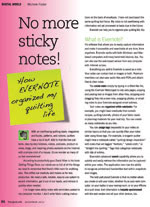 You can read it here: No more sticky notes: How Evernote organized my quilting life [PDF file]. My best tip: It can be overwhelming to start using Evernote, at least it was for me. My suggestion, start small, use it to organize something in your life that you need help with (patterns, recipes, etc.). Once you become familiar with the program, keep using it. It took me a good six weeks before I found my own system for using it and now it’s just second nature. See a pattern or tutorial I like.. clip it to Evernote. Receive an email that I need to keep track of… send it to Evernote. Have a great idea in the shower, write it in Evernote so I can action it when I have time. Evernote is free and they also have a premium version with more space and functionality. I have coupon codes for upgrading to the premium version to give away, see below for how to enter. Not a week goes by, when I don’t hear at least one of my quilting friends complaining that their hard drive failed, or some other calamity, and they’ve lost all their photos, patterns, designs, etc. Literally, years worth of their quilting life, family photos, etc. gone. It doesn’t have to be this way. Seriously! There are inexpensive solutions available to protect you from losing all your valuable stuff. Dropbox is a free service that lets you bring all your photos, docs, and videos anywhere. This means that any file you save to your Dropbox will automatically save to all your computers, phones and even the Dropbox web site. Dropbox also makes it super easy to share with others, whether you’re a student or professional, parent or grandparent. Even if you accidentally spill a latte on your laptop, have no fear! You can relax knowing that Dropbox always has you covered, and none of your stuff will ever be lost. In simple terms, you install the free Dropbox software on your computer. It creates a new folder on your machine (within My Documents on Windows) and then everything you put into the Dropbox folder is backed up and available on any other device you install Dropbox onto (such as your laptop or work computer), your smart phone and the Dropbox web site. It’s that easy! You can also use it to share folders with other friends, family and colleagues, or even share files in the public folder. For me, not only do I have the peace of mind that my files are safe should something catastrophic happen, the same files I have on my main computer are automatically updated on my laptop and the Dropbox web site. I can be anywhere with Internet access and get at any file I need simply by logging into the Dropbox web site. Additionally, Dropbox keeps track of previous versions of my files. The other night, I lost two weeks of work due to accidentally overwriting a critical file on the web server. I panicked, until I went to Dropbox and retrieved a previous version of the file from 3 months ago. Whew! Dropbox is free for a basic account which includes 2 gigs of space or you can purchase additional space at a reasonable cost. I also have coupon codes to give away for adding 10 gigs to your account. Find out more about Dropbox and download it here. We live in the digital age and there are solutions that can help you stay organized and protect your files too. I hope you’ll give the above two products a chance. This isn’t a sales pitch, I really do use these programs every day. Both companies have sent me coupon codes to give-away to my readers. I have four Evernote premium coupons and six 10-gig upgrade codes for Dropbox. To enter the give-away, leave a comment below sharing how you currently organize your quilting magazines, books and patterns. Are you a magazine hoarder and have issues dating back to the 1990s? If you had to guess, how many single paper patterns do you own? Do you think you’ll ever make them all? Fess up, let’s hear what’s in your sewing room and how you organize it. Winners will be randomly selected March 1st. If you have a preference for either Evernote or Dropbox, please include in the comments too. Next Tuesday is our last Studio Organization post and we’d love to see your progress! So get those photos snapped and onto your blog for the Tuesday “After” or “In progress” Link party! We have lots of great prizes to give away too. I shared a few photos of my cleaned up space here. Next month in the Learning Center is devoted to Quilt Basics! We’ll be discussing quilt terminology & anatomy, fabric types & styles, quilting history and quilting for charity, just to name a few of the topics. What basic quilting skills would you most like to know about? Email Pat or Michele with your suggestions. I keep my mags for about a year…then I go through them all and if something really catches my eye, I rip it out and put it in a binder. I do think I have to stop doing that though as I know I will “never” even get close to doing 1/4 of those projects in this lifetime!! I am a magazine hoarder – I have issues dating back to before I even quilted! And I have inherited magazines from friends and relatives too! I print out tutorials for blocks I want to make or have made and keep them in a binder together. I guess I should probably find a digital solution eventually! I’ll confess–I’m a magazine hoarder. Forget the 90s–mine go back much further than that (think decades). And they’re all stored in chronological order. I use to refer to them constantly for inspiration, but now I usually look online when I need to jump-start my thinking. It may be time to consider a reduction in the number of magazines that I actually keep. Right now my magazines are just grouped by each magazine title. But it is getting out of control and I realize I’ll never make all the quilts that I like, but I keep them just incase I need a certain kind of quilt. I am starting to look for ideas to store these and organize my sewing room, so this is a timely article. My books are organized by “technique”, such as appliqué, scrappy, borders, seasonal/pictorial, basic instructions, etc. My magazines are saved into plastic shelf holders by date and by name of magazine. My file cabinet (I know, old school) has file folders alphabetized by category such as: Amish, Animals, Attic windows, Bargello, Baskets, Birds, Cathedral window, Easter/spring, Fall, Fan/Dresden plate, Floral, Fruits/berries, Halloween, etc. Etc. i give my quilt mags and some pattern books to my sis for her quilt club after i scan anything i want to save into my quilting folder. then i add the new quilting stuff into my 8gig thumbdrive to save it. this extra drive saves all my quilt stuff … patterns and tutes from the web blogs, shops, emags, etc; wips and finished pix, ideas [pix of quilty things that i like]. i have drop box that i’ve put my very favorite patterns in, but the free space is very limited and i’ve hesitated to buy more space when i have a system that works. I have gone thru so many magazines & kept so many but like you, you can only do that for so long – even if you are a “charter subscriber” to some of them!! I tear out the ones I want, but then those patterns may back up to another so I have a stack to copy off ……. and so it continues. As for my books – tons & tons, it’s very hard to get rid of those, they end of like “collections” of different designers!! I tend to keep certain designers together and then some of like things together – it’s something only I would know – LOL!!! I have another stack that I feel like I “could” pass on but not yet!!! As for patterns, I have a huge drawer of a two drawer filing cabinet. The top is household things and bottom is sewing & quilting – that really needs thinning!! I have some from when I begain quilting and I will probably never do again – they are separate from any clothing patterns. I will definitely be looking into both programs you mentioned – sounds like I need both!! Thanks bunches for that!! I’ve kept so many magazines over the years! Quilting mags have only cluttered my space for about three years, but I had all kinds of home ones, woodworking, etc. I finally started tearing out the projects/recipes that I’ll probably never make to stick them in a binder. I’ve kept all the quilting ones in tact and they are in about in order by title then year/month in about 8 of those plastic magazine holders. My worse problem is all the stuff I print – tutorials, QAL instructions. I have about 10 three inch binders full of those printouts. I also save a lot on my laptop. I have a ton of memory dedicated to that. I’m looking forward to checking out Dropbox. It sounds a lot better than the way I’m doing it! Not too many quilting magazines… but do have a collection of Ottobre and other European sewing magazines with their patterns. And some back issues of threads. I admit I love to keep my magazines and books. I have resorted to tearing out and keeping patterns I really like but that was only on the really old magazines. Occasionally (not very often, I will admit), I will go through my books and weed out. But, I love them all. I keep telling my husband I need a house for me. I haven’t gotten into scanning patterns, etc. but it sounds like a great idea. I’m not that computer savvy so I’d need a lot of help. Thanks for the opportunity to get with the cyber times. As I’m very paranoid about my stuff I would never use an online storage – I external hard drives for back up, they are not expensive anymore and if you take one with external (that means not via USB) electricity supply they can be quite big and fast, just plug them in every sunday and do a backup. As for organizing books – keep any book sequence (books in a row) under 2 meters, else you will just subconsciously miss the middle… If you can’t tell what is in a book by it’s spine or front cover it is no good and can go to someone else, that’s an easy and effective rule. I draw my patterns myself and then do the math and the patterns then usually end up in the bin at the end. I can always draw them again. I rip out what I want and put it in binders. Periodically, I go through the binders and get rid of the ‘what was I thinking’ items. I go in and do this when I’m in a brutal cleaning out mode. Helps to watch ‘Hoarders’ first…. I rip out pages from magazines and keep in a binder. Every once in a while I go through and pull things out that I don’t love and add the new ones. My patterns are kept in a big basket on a shelf with my books. Once I make a quilt from a pattern, I take it to my guild to give away. as for books, I put stickie notes on the quilts I want to make some day. This year I am pulling books and making the quilts I like and then will send the books to a new home. So far, I have prepped two quilts from two books. I would love a Dropbox coupon. OUr computer has soo much stuff on it. I would love to put all my pics and quilty stuff in one place so I could access it on my laptop or ipad!! I’m a book and magazine hoarder too!! I have MOST of my books in Excel (title, author, date of purchase, etc. ); I need to update my list . . . MAJOR!! I may have 100+ paper/single patterns; no list and no order! UGH!! Yes, it takes a search party to find one. When I get a new book I always tell my husband and kids that when I retire I plan to make ONE project from each book (200+) — Hilarious? Probably won’t live long enough to accomplish that but, hey, I’ve set a goal! LOL! I don’t have a craft room; I have a craft area. And, it’s not big enough to hold all of my stash and stuff (alot of it is stored in wooden crates in our barn, not handy much!). I’m dreaming and praying for a “Craft Barn”! I’m not familiar with either of the Digital Storage suggestions; sounds like either one would work mighty fine . . . overwhelming getting set-up!! I confess – I have a zillion e-tutorials stored on my hard drive. In the event of a crash, well, then I’ll have none. I’ve just signed up for Evernote on my tablet, but I didn’t accept the sync option yet….who knows why! :) And I haven’t really gone exploring all its options yet, but Pat’s example makes it look easy! And I have two binders full of patterns that I’ve made or plan to make. Sometimes, I put the fabric and the pattern together in a zippered bag (from sheets or blankets) and then onto the shelf….where it’s never seen or heard from again! I organize my magazine by month and they are in a shelf with my books and I love print tutorial,blocks and projects … and put the in my to do list in a cartable. My magazines are organized by publication and month in plastic magazine holders but I’m outgrowing that method so I think I’m going to try Carrie’s Portfolio idea. My books are just stuffed into a cabinet sometimes by author, until I pull them out to look at them and then they end up back on the shelf anywyere. I have 2 plastic bins of patterns. One is printed patterns I’ve gotten off the internet and the other are the patterns I bought in the plastic sleeves. Problem is neither lid will fit on the bins any more. Good luck trying to find a specific pattern, book or magazine in this system! :) I’d much rather sew than organize which is obvious if you could see my quilt room! I only subscribe to 1 quilting magazine now. I went thru all of the others and took out the pages I wanted and then gave the magazines to anyone who wanted them at our guild meeting. I told them there were pages missing first. My magazines are in the stand up boxes by date. I have so many patterns that I know I’ll never be able to make them all. Love a chance to win. I am not very organized. I have art type quilt books in the living room book shelf, at least what will fit. Then all other quilt books are in my sewing room. I soared these by Piecing books, quilting patterns, appliqué books, and then the different magazines, newest on top of stack. I have beading books and knitting books too. Each on a shelf together. My Mom and I share many books so we have a list of all our books and who owns which book. I have all my magazines and books on two bookcases. One bookcase is completely full (4 shelves), and two shelves of the other are used for quilting magazines. The other two shelves hold computer info and non-quilting books. Organize?–you’re supposed to do that?? There are some here and some there and some on the computer. I just learned about Evernote, but haven’t really tried it out yet. Quilting books I use most often for reference or inspiration are in a bookcase in my sewing room. Ones I consult occasionally are in a bookcase in the hallway. The ones I haven’t used in ages are stored beneath a daybed in the nearby family room. Dyeing and textile design books have a home in my dyeing studio. And books I’m currently interested in seem to be clustered near the couch and bed upstairs for handy reading. And I’m guilty of storing tons of quilt-related info on computers and portable drives, loosely organized by year and topic. As soon as a magazine comes in the house I photocopy the table of contents and keep it in a 3-ring binder. So if I’m looking for something I can sit in a chair and look through. I have all of my printed patterns & magazines in 3-ring binders. I covered the binders with leather (I made them like a book cover with flaps on the inside, I stamped the end of the binders with what letters are in them & if they are patterns or magazines. My other patterns I have on CD-RW’s. My DH thought I would never get organized. It took me about 6 months to do them, but I finally got them all done and now DH & I are happy. My magazines go back to 1981. I was thinking of decluttering to free of my space and my mind. I’m a rip it out, put in a binder girl. Periodically, I go back through the binders and pull out stuff I know I’m never going to get to. I scanned what I wanted to keep out of the magazines. Then I bundled them up and donated them to the public library. They sell bundles of old magazines to raise funds. I’ve also donated books to the library. I figure if I really miss them I can check them out! I’m in love with Evernote, too! I use it to keep track of a lot of things for my job. I keep all my magazines and books on the bottom shelf of a bookcase in my room. I try to weed out the ones I know I won’t use. I have my studio in the 2nd largest bedroom. Luckily, we are empty nesters, but there is just not enough room for my cutting table, quilters dream cabinet & now my Handiquilter Avante. I use a closet with the doors removed for my stash, and have 4 shelves now bowing from the weight of my magazines. They are neatly filed in magazine holders, but they date back to the 90’s. I think I subscribed to 6 different magazines until recently. I rush to read them the day they come in, then they are filed. I need a way to store what I might use and get rid of the rest before the shelf comes tumbling down. I notice that my creativity is stifled at this point, because I spend half my available time organizing things in my studio. Help before the avalanche kills me! My magazines are in stand up boxes, and I keep them forever. I like to take one box and see through the magazines when I run out of ideas. That always helps. I keep my books on another shelf in the bookcase. I have two different areas to keep magazines and books. I don’t honestly have a lot of magazines as I don’t subscribe to them. Once in a while I will pick them up if I see a pattern I really, really, really like. Magazines I keep in several magazine holders on a shelf. I do have quite a few quilting books. Those are kept in two different areas in my sewing space. The actual quilting books, longarm quilting books, and quilting patterns are kept in shelves near my longarm for easy reference. My quilt making or pattern books are kept on shelves in my sewing room. I do need to go through these and get rid of older books that I am no longer interested in. My main “stash” and hoarding is for web-based patterns. I see so many cool patterns and things I want to make on-line that my computer is loaded up with projects I may make some day. I really need to go through those and clean them out also! I have Evernote but just started using it and hadn’t thought to use it for this purpose. Something else to do! I save only the magazines that have several projects or ideas that I want t pursue. Otherwise I tear out and file in a binder. Have reached the point where this system need refining. Books are my weakness, besides fabric, gadgets, etc., I have a list that is mostly up-to-date. I try to review it regularly but on at least two occasions, that obviously hasn’t worked. Every year I weed out those that no longer interest me. Your article is timely as a general reorganizing is in order. Winning a coupon would be a wonderful boost to jumpstart the spring cleaning process. WHAT your quilt mags ONLY go as far back as the 1990s? Seriously, I am an organized hoarder of those great publications. In this day and age of electronic storage, I should be better at that and purge the printed materials…I organize by title and date, most recent on top. As for single patterns, I sort by type, ie wallhanging, quilts, clothing, children clothing, etc and store in totes. Well I am not very organized period. The magazines and books I have are in piles on a dresser in my sewing room. I do have 3 ring binders for some patterns that I printed out from different websites and blogs that I think I will do some day in the far future. I also have some saved different spots on my computer. I have patterns that I have bought stored in a box that I have under my cutting table. I really like the Dropbox idea. I am going to have download that and read up more on it. We recently moved and I have lots of quilt magazine. I also have torn pages from magazines as well as free patterns I’ve downloaded and copied. I’m in the process of setting up my sewing room so I’m looking for ideas to help me. I really do want to be able to get to and use my patterns and magazines. Right now I just have them seperated by the different magazines themselves. Thank you and the Sponsors for a great giveaway and a chance to win. If I’m chosen my first pick is Dropbox but will not say no to Evernote. hehe. I just wanted to thank you for intrducing me to Evernote back in 2010 (where did the time go?) It has been such a help and become the memory I need to have. I keep so many things on it, one friend just rolls her eyes everytime I mention Evernote, but it is one of the few organized pieces of my life.